Low carb Taco Chile Relleno takes the best of both, Tacos and Chile Rellenos give you an easy, Chile Relleno Casserole. All the taste, none of the fuss! So today I thought I’d make a Chile Relleno Casserole, except I needed more protein in it than normal. So I thought I’d put ground meat in it and then I decided to flavor it with taco seasoning. 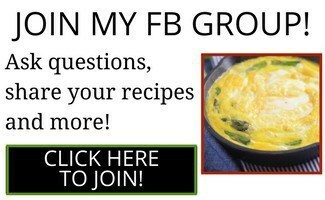 Those were all great choices and it turned out to be a recipe I will make on a regular basis! Turned out savory and not spicy. I might add a little cayenne next time just for me, but for the rest of the world, this is probably just right and great for families with kids. There’s really not a lot to this, or any fancy spices in it to make it difficult to cook. You probably have anything you need to make this in your fridge and pantry right now. 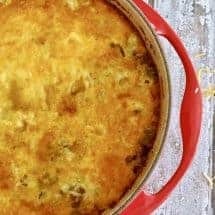 This is a rare recipe where I will use my oven to cook, but it just makes sense for this Chile Relleno Casserole recipe. CHECK OUT MY MEXICAN CHICKEN GREEN ENCHILADA CASSEROLE HERE! 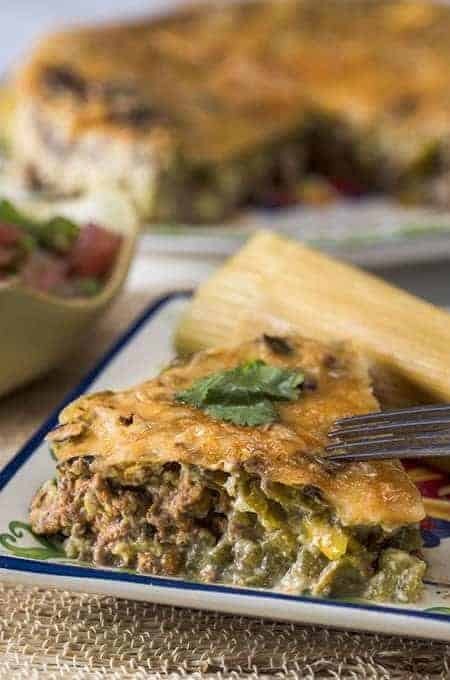 Low carb Taco Chile Relleno takes the best of both, Tacos and Chile Rellenos give you an easy, Keto Low Carb Taco Chile Relleno Casserole. All the taste, none of the fuss! Brown the ground beef and add in the taco seasoning when the meat is no longer pink. Mix well. Spray an 8 x 8 glass pan and put the seasoned ground beef into it. In a bowl, whisk together the eggs, milk, and flour until no lumps remain. 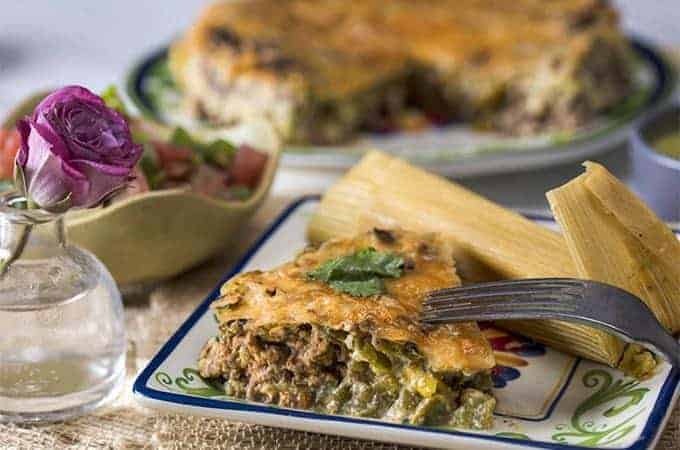 Carefully fold in the green chiles and the cheese, using a spoon to stir it together. Pour the topping over the ground beef mixture and place in 350-degree oven for 20 minutes, or until the top is browned. To make this Keto, I use 4 eggs, 1/4 C heavy cream, 1/4 C water and omit the flour. I was really excited when I found this recipe as I am eating Keto. This recipe is not Keto. Flour is definitely NOT Keto. I suggest changing the title to omit Keto. Made this last night but substituted ground turkey (white/dark mix) for the ground beef and added a 15oz can of fire roasted tomatoes to the meat mixture in addition to the taco seasoning. I let the liquid from the tomatoes cook down prior to putting the meat mixture in the casserole dish. The cook time was almost double for me and my oven is calibrated. (30-35 min). We enjoyed the recipe and I would definitely make again. I put out thinly sliced scallions, chopped cilantro, fresh avocado slices and sour cream for topping choices. I served trader joe’s mexican style corn as a side dish. Do you use the canned green chilies? I would suggest that you change your Pinterest link so that it doesn’t say every recipe is “Easy, low carb, high protein, keto, gluten-free, kid-friendly, food in under 30-minutes in your pressure cooker.” This one is not Keto as it has flour and milk in it. With minor changes it can be, but it is very misleading. Cathy that’s a very legitimate request. 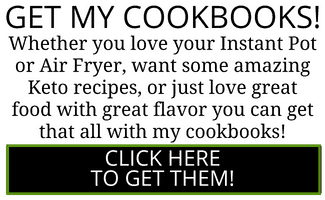 The issue is that I started blogging recipes over 4 years ago. I didn’t even know about Alt tags and descriptions being an issue on Pinterest. You will notice that all the last few months have proper descriptions. I now have the daunting task of going back to fix 200+ recipe pin descriptions on Pinterest. Rest assured I’m going back and doing them a little bit at a time. I very much appreciate your taking the time to comment. Having said all that, the recipe as 8 gms of carbs per serving so it continues to be low carb and keto. But I appreciate that’s a different point to uniform descriptions for all pins. This looks and sounds delicious! But, I wanted to ask about the 1 cup sweetener that you have listed in the topping ingredients? Hi Cheryl, wondering if you posted this on the wrong post maybe? I see the same thing – 1 C sweetener but no listing of cheese (shredded cheese). Whoa that is so odd! I rechecked the recipe and mine still says cheese? I heated the oven to 350° but it took like an hour in the oven to fully cook, has anyone else had this problem? It was very delicious though once it finished! Really? An hour? That seems crazy long. I need to try it this weekend again. Glad it tasted good. Sounds like your over needs calibrating! Get an oven thermometer at the grocery store and check to see if it’s really 350*. Yes I think so? It’s been a while since I made it but others seem to have made it successfully by following the recipe. made this tonight for dinner. good! a keeper!! Yay! That makes me happy. Thanks for letting me know. I add potatoes in mine and it’s really good sometimes I will eat it with a tortilla! ???? I need to make this again. It’s been forever. Do you cook the potatoes first? Yes I do and then I mix it with the ground beef and taco seasoning so it gets some seasoning too! ???? Looking at recipes to try to eat better and this looks GREAT! But what do you eat it with? If you bring in tortilla chips or something like that it defeats the purpose of being low carb. You can use pork rinds as the chips. Oh I love that idea! Yes definitely you could. I hear they’re yummy and I know they’re quite crunchy. I need to try some. I think i’m going to try this now using ground chicken! Looks so good! Just started stage 4 eating. This looks nice. Does coconut flour exchange with reg flour? 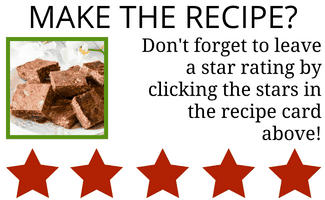 Try Bobs Red Mill gluten-free baking mix. It works extremly close to regular flour.